Superman cards, 1941, Gum, Inc.
Look! Up in the sky! It's a bird, it's a plane, it's super expensive but really cool vintage Superman cards! Yes, Superman. Strange issue from another era that came to market with prices far beyond those of normal cards. But what made these 1940s cardboard comic cards so popular and pricey today? It's more than the fact that Superman is a proven commodity, still being produced in modern comic books and motion pictures. I believe this vintage set has special appeal because it is so representative of the innocence and antique attitudes of the times. Let's have a look at some of the more outrageous aspects to this 1941 Gum series. First off, there's the red cape. My advice to any crime fighter is not to wear capes. They are convenient choking tools for anyone fighting you, especially if they are prone to cheating and not playing fair. Superman never seems concerned about that though, or the difficulty of carrying around such a large piece of unnecessary cloth for his secret disguise, which he always manages to conceal somewhere on his person. (Is that a cape in your pocket or are you glad to see me?) One thing's for sure: That cape is always dramatically extended and blowing in the wind, even when Superman is underwater (see #45, #47, & #52). 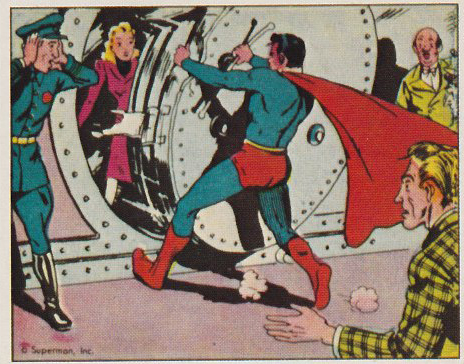 In card #8, Rescue at the Bank, Superman's cape is at a stiff 90-degree angle, despite him standing inside a building and backing away from a safe. Perhaps his cleaner uses Super-starch! And speaking of costumes, The Man of Tomorrow (as he is repeatedly referred to in the set) really needs to re-evaluate his priorities when weighing the importance of a making a dramatic entrance compared to the value of human life. He never appears out of costume, even when time is of the essence and he could easily perform his rescue without being seen. Take card #71, Trapped in Quicksand for example. Clark Kent (Superman's alter ego) hears a boy's screams for help and races—not to save the boy—but to “quickly shed his outer garments” to better look the part before finding out what the emergency is. Fortunately, he gets there in time before the boy drowns in the ooze. 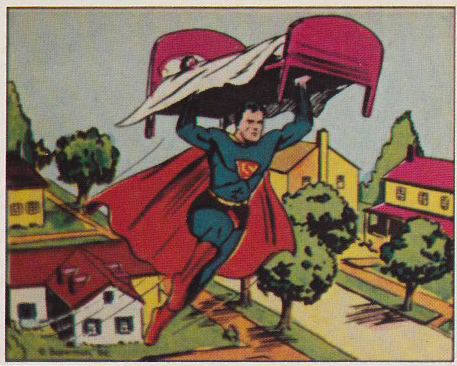 The card shows Superman flying down and lifting the boy up from behind, making it impossible for the kid to see who is behind him. They’re in a lonely bog for heaven's sake, there are no other witnesses to hear the boy, let alone see the rescue. Why risk the lad's life to change clothes? Priorities, Clark, priorities! “Lighten up!” you say, “Everyone should be cut some slack now and then.” I would normally agree, but this isn’t a now and then situation. It's a recurring theme over and over again. In card #29, Death Dive, a circus diver jumps from a 60-foot-high dive to a three-foot deep tank of water. Kent notices the water has leaked out, and while the performer is literally diving to his death, Kent pauses long enough to change costumes before whizzing over the crowd to catch the diver “an instant” before he hits “the almost dry tank.” Okay, that time there were witnesses, but if he's really faster than a speeding bullet, who's gonna see the outfit anyway? Card #59, The Dive of Death, takes the same concept even further. This time, the circus diver wears an asbestos suit which he lights on fire and dives to the tank below. Alas, “the former Star of the circus, seeking revenge, had filled the tank with gasoline!” (Could this be the first diver that Superman saved, who was later fired for not setting himself on fire?) “The Human Torch dived, but when he splashed into the tank there was a great roar of flame…. There was not a moment to lose, or the diver would perish.” So sure enough, Kent loses a moment to leap behind the stands and strip off his outer garments. Then he blows out the flames with a mighty super breath. But air is invisible. Why not just blow it out from the crowd? Who's going to notice someone exhaling at that exact moment? Their attention is focused on the guy flailing around in the tank of burning gasoline. So while Kent it removing his outer layer of his clothes, the gas is burning off the inner layer of the victim's lungs! In card #48, Death in the Air, a woman pilot bails out of her burning plane during an air show and the crowd gasps as she falls to her certain death. Kent “darted into a hanger and, throwing off his outer garments, stood revealed as SUPERMAN!” I don’t know which sounds like the greater waste of time, finding an empty hanger or pausing after your quick change to “reveal” yourself as SUPERMAN! He manages to saves the dame in time, but what if he hadn’t? Would that just have been one of the many exploits we never heard about? And what about card #70, Danger in the Woods? Kent spies a tripped lumberjack with a tree falling on him. “Ducking behind a bush, he tore off his outer clothing. A split second later he emerged as SUPERMAN! Streaking to the injured lumberjack, SUPERMAN reached him just in time…” That “split second” delay could have squished the lumber worker into Brawny paper towels. Let's hope Kent wasn’t “streaking” to the rescue the way college kids typically streak, even though it did say he “tore off” his clothes. And if we concentrate Super hard, we may also be able to avoid humming Monty Python's Lumberjack song. I think I made my point, but if there’re still any hold outs, examine card #15, Panic in the Subway. A little girl is pushed onto the subway tracks. “Just then a train roared around the curve! Without thinking twice, Clark Kent changed to SUPERMAN.” He stops the train “within an inch of the child's body.” ‘Nuff said! The same mysterious leverage occurs in card #25, Trapped in the Air. Little Eddie and Tommy Gray climb into a balloon basket at the County Fair and cast off the mooring ropes. Superman sees them floating away and leaps to the rescue. “Grasping the balloon basket in a grip of steel, he started downward, bringing the bag and its human cargo safely to earth.” What does the power of his grip have to do with it? Without a mooring to pull them back toward the ground, his weight is the only thing that can affect a decent, and how could he change that? Pig out? I also enjoy how preachy this set is, especially when it comes to instilling guilt into youngsters who disobey their parents. Here's #3, From the Jaws of Death: “Jimmy Watt and Dan Doyle had been warned time and time again never to play near the railroad tracks which ran through their town. They should have known better even without being told, but the fact is that one day they disobeyed orders and went down to watch the four-ten whiz past.” One of them trips on the tracks and knocks himself unconscious. The other kid returns to help his friend. Superman happens to be in the area. “He swept the lads from the tracks just as the roaring iron monster screamed past. Jimmy and Dan promised SUPERMAN never again to play in such a dangerous place. What's more, they kept the promise!” So let that be a lesson to you, kids! If you thought Superman looked funny in blue tights, imagine him in Boy Scout shorts. Card #69, Saved from Burial Alive, provides another patriarchal parable. “Clark Kent accompanied a troop of boy scouts on their nature hike. One of the boys suddenly shouted that he had discovered the entrance to a cave. Immediately the group was bent on exploring it, but Kent counseled against it because it might be dangerous.” Two of the boys ignored his warning and were not missed until sometime later.” Sure enough, they get trapped in the cave. (They should have listened to their elders!) Kent abandons the troop to rescue the boys as SUPERMAN. “When the boys emerged they promised never again to ignore their leader's judgment.” Doesn’t that imply they knew Superman was the same guy who first warned them not to explore the cave? But Superman wore blue and Kent wore green. Plus those glasses! How could they possibly guess…? Here's another fabulous fatherly fable, and a prize candidate for the Darwin Awards: #58, A Near Tragedy. “It's amazing what foolish things boys will sometimes do. Take for example, the case of Jack and Eddie Judson. Normally they were bright enough, so it's hard to understand how they happened to be so crazy the day Eddie's uncle sent him a bow and some arrows. They decided to play ‘William Tell.’ The bow and arrows belonged to Eddie, so he was to be William Tell, while Jack played the son. He placed an apple on his head and stood straight and still. A dozen paces away stood Eddie, with the bow taut, aiming at the apple on Jack's head. The bowstring twanged, and the arrow flew fast and straight—for Jack's head, not for the apple! Luckily, SUPERMAN just happened to be whizzing past. Sensing tragedy in the making, SUPERMAN streaked down like a blur of blue light and stopped the arrow just in time!” They were lucky alright. If Superman weren’t already in costume, this story would have been discarded for very bloody reasons. But all's well that ends well. “Jack and Eddie both promised SUPERMAN that they would never again point a weapon—even a toy one—at anybody. The near-tragedy had taught them how dangerous it could be.” Amen. It also teaches us how opportunist modern kids have become. If this happened today, one of the survivors would realize that stupid actions attract Superman like poop draws flies. They would repeat a similar stunt with a hidden video camera and post the footage on YouTube. Then everyone else would follow suit. Sigh! Gum, Inc., the makers of these cards, however, was farther behind the PC curve. Card #54, Rescue From the Flames, tells how a differently-abled boy was saved by Superman. But the ignorant crowd was too insensitive to recognize their stigmatization. When one witness spots the boy on the upper floor of a burning building, he gasps, “It's Tommy, the little crippled boy!” Superman-- after changing-- leaped high into the air and straight into the fire. “The apartment collapsed in a writhing mass of flame… but the little crippled boy was saved!” Too bad he left the wheelchair behind. Superman can carry a bed across the continent for a sick girl but not a wheelchair down a few levels for “a little crippled boy.” What would ADA say about that? The most cringe-worthy Superman anachronism is his treatment of rare and exotic animals. Although he never seems to kill any criminals, he always kills or maims the innocent animals. In fact, the more endangered they are, the more likely they are to be executed by The Man of Steel. In card #42, Danger in the Jungle, he breaks the neck of a rare rhino because it dared to attack the hunting party that shot it. In card #43, Fight in Mid-Air, some boys try to steal the eggs of one of the world's rarest species, the California Condor. The giant vulture returns and absconds with one of the boys. 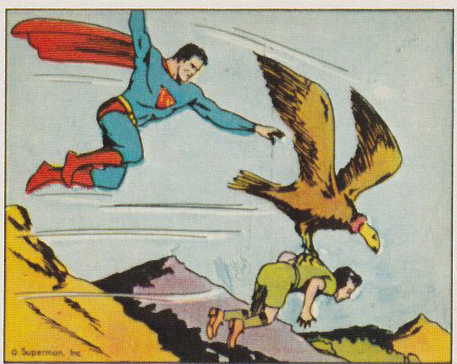 Rather than just take the boy back from the bird, Superman “tied its wings into a knot.” Considering they have wings nearly ten feet wide, that would be pretty painful! And let's not overlook card #56, Superman and the Killer-Whale. The often hunted whale turns to fight those trying to harpoon it. So Superman “grasped the monster and dragged it down into the depths. Thrusting the head of the powerful whale into the thick mud of the ocean's bottom, SUPERMAN held it there until it smothered. The killer-whale made a fine trophy for Captain Britt.” Well, at least we’ll have a stuffed whale when all the others are gone. Hurray for Superman! If you’re one of the collectors who has this set, you not only have a rare collectible worth thousands of dollars, you also have a delightful window back to simpler times. The artwork is not one Bowman's better releases. In fact, it's crude when compared to their classic Horrors of War, Lone Ranger, or Wild West issues. But what it lacks in art, it makes up for in campy writing. Remember, these are just a few of the 72 cards. There's plenty more! There's also a cheap 1984 reprint for those who are not in the upper 1%. So do yourself a favor and read these little gems. You’ll have a Super time.